This past weekend I had the opportunity to take not one but two Odyssey cruises on the Boston Harbor. On Friday night I joined a small group of Boston Food Bloggers for a dinner cruise, and on Sunday morning, I joined a group of Boston Brunchers for a brunch cruise. On Friday evening after work and a quick detour home to retrieve my forgotten wallet, I set off for Rowes Wharf to meet up with the nine other bloggers who would be attending the dinner onboard the Odyssey. It started raining just as we were boarding. With clouds in the sky and the sun setting soon, we realized we probably wouldn't have the greatest views from the boat and settled in at our table. Because we were attending as bloggers, our dinner (typically $89.90) was complimentary, and we soon learned that dinner comes with one included drink. We were on the Wine Lovers' Dinner Cruise, so there were three featured wine offerings from Westport Rivers that evening. For my one included drink, I chose a glass of sparkling wine (2005 Westport Brut "RJR"). 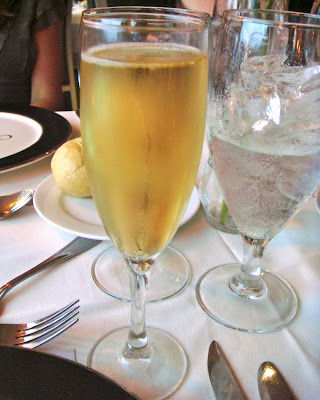 I thought a little crisp, bright, pear-flavored bubbly was just the thing to kick off dinner. Later on in the meal, Meghan, Daisy, and I ordered a bottle of Wycliff sparkling wine to share ($28). As we looked over the dinner menus and started trying to figure out what we would select for our first course, entree, and dessert, servers came around with warm rolls. It was a tough decision, but I opted to try the shrimp and corn chowder (roasted sweet corn, Gulf shrimp, red peppers, and potato with fresh cream with an herbed crouton). The soup came in an adorable cup, and the server immediately poured it into my bowl. I decided the hearty chowder was the right choice for a gray, rainy evening. It was both sweet and spicy and not overwhelmed by the flavor of red peppers, which is something I always worry about when they're included in a dish. For my entree, I stuck with the comfort food theme and ordered the short ribs (braised beef short ribs marinated in a shallot and wild mushroom gravy, served with garlic mashed potatoes, puff pastry, and crispy onion straws). After being served Meghan's chicken and Rachel's ravioli, I sat with an empty place setting while everyone around me had their entrees before them. When our waiter came to check on us, he noticed I hadn't gotten my entree, and he rushed off to find it. The short ribs were tender and well flavored. I pulled gently at them with my fork and pieces fell right off. The garlic mashed potatoes were a nice match, but the puff pastry was too crisp and a little out of place in the dish. After moving through our first two courses pretty quickly, our waiter asked if we wanted to wait on dessert, which we all did because we were full. Some of us took our drinks and wandered upstairs to get outside for a little bit. The middle two floors of the boat were occupied with private parties, but we were able to go up past them to the back deck. On a nicer evening, I imagine it would be much more pleasant out there, but we were all getting pretty windblown and didn't hang out there for too long. When we returned to our table, some people ordered coffee or tea (I stuck with my glass of bubbly), and then our waiter brought our desserts. I chose the raspberry mousse cup (raspberry mousse served in a dark chocolate cup, finished with homemade whipped cream and raspberries a raspberry). I love desserts that combine chocolate and something lighter and fruitier. The raspberry mousse was definitely fruity, but it fell short on lightness. It was much heavier than a mousse should be, and I was left wondering what was put in it to make it so heavy. Even so, I enjoyed the dessert, especially the chocolate cup, though I did miss the whipped cream. We disembarked around 10 p.m., and I trekked home in the rain, sufficiently full and ready for bed. I spent Saturday wedding dress shopping with my mom, sister, and matron of honor and then returned to Rowes Wharf around 11 a.m. on Sunday morning to re-board the Odyssey, this time for a brunch cruise. The weather was absolutely gorgeous -- blue skies and bright sunshine. I was excited about brunch but maybe even a little more excited about the prospect of soaking in a little sun too. Once we boarded, we were led to the same lower deck where I had sat on Friday night, but our tables were on the other side of the boat this time. When I sat down, I found a complimentary glass of bubbly in front of me, and a waitress soon came around to ask us if we wanted our complimentary bubbly to be turned into a mimosa. I'm always down for brunch mimosas, so she added a splash of orange juice to my glass. To the left of our table, we could see the brunch buffet. The breakfast items were on the side closest to us, and the lunch items were on the far side. I decided my game plan would be to start on the breakfast side and then head to the lunch side for the second round. I filled my plate with some roasted potatoes, scrambled eggs, bacon, a croissant, and a slice of carved-to-order black pepper-crusted sirloin with a dollop of horseradish. The potatoes were tasty and actually all very soft and tender. I'm usually wary of scrambled eggs on brunch buffets, but these were fluffy and cheesey, and I was pleasantly surprised. The bacon was crisp and enjoyable, but the croissant was like a roll, lacking buttery, flaky layers. The sirloin was well done (and dry), which I was not expecting, and I couldn't eat it. I also had a piece of strawberries and cream French toast (not pictured), which was coated with a thin layer of strawberry cream cheese -- just enough to add a little sweet, fruity flavor. After my breakfast course, I scoped out the lunch side and piled my plate with Caesar salad, roasted summer veggies, and penne primavera. The veggies and penne needed a little salt and pepper and were best eaten together, in my opinion, and the Caesar salad was quite good. There were several cakes and a chocolate fountain, but I was pretty full, so I just tried a bite of Bianca's red velvet cake, which had a layer of chocolate and frosting between each layer of cake and was incredibly moist. I kind of wish I skipped the rest of brunch and went right for that cake! Daisy and I decided to order drinks and head upstairs and out to the sunshine. I went with my standby, the St-Germain cocktail, but the Odyssey makes it with Grey Goose vodka, so I asked for it without vodka and essentially got St-Germain and Champagne, which was just perfect -- effervescent, floral, and slightly sweet. Oh, and it came with an edible orchid, which made heads turn wherever I went with my drink. The top deck of the boat is completely open, so we headed out there, walked around taking pictures, and found some seats in the sun. I felt completely relaxed and happy. I really think I needed some serious Vitamin D, and a brunch cruise on the Odyssey delivered. Please note that dinner was a Boston Food Bloggers experience and may not be a typical experience, and brunch was a Boston Brunchers experience and may not be a typical experience. For both meals, all of our food and one drink was included, and we paid for any additional drinks we had. Have you ever taken a mini cruise like this?